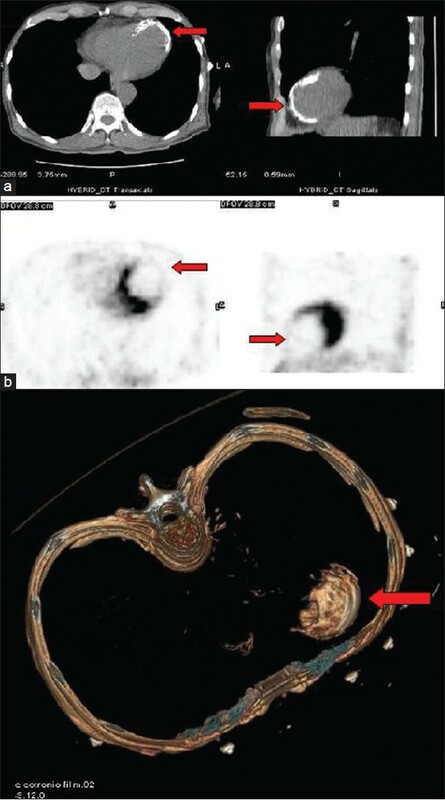 Cardiac PET/CT can show massive dystrophic calcification of the myocardium in the area of myocardial infarction [Figure 1]. Figure 1: (b) Shows the area on non-viable infarct in FDG PET images (arrows). 1. Kim MK, Chung WJ, Oh KJ, Choi EY, Yang SM, Shin EK, et al. Dystrophic endocardial calcification associated with prior myocardial infarction. J Korean Soc Echocardiogr 2005;13:33-6. 2. Pande AK, Sethi KK, Jain R. Pictorial CME. Dystrophic myocardial calcification. J Assoc Physicians India 2001;49:256.